Quality Assurance and Quality Control for your imaging procedures. The quality of a clinical PET/CT scan relies on delivering a precise dose of radiotracer to the patient for a precise uptake period. Precise dose information is necessary to accurately calculate results based on the PET image. Standard practice is to measure the empty syringe in the well counter, so that any remaining radioactivity can be netted from the original syringe value, to establish an accurate net injected dose. Consistency of uptake period length is required to ensure sufficient contrast in the scan for evaluation, as well as comparability of the resulting image to other images. Bolus injections (a volume of fluid injected rapidly) are standard practice to deliver the radiotracer to the patient’s circulation all at the same time to start the uptake period. 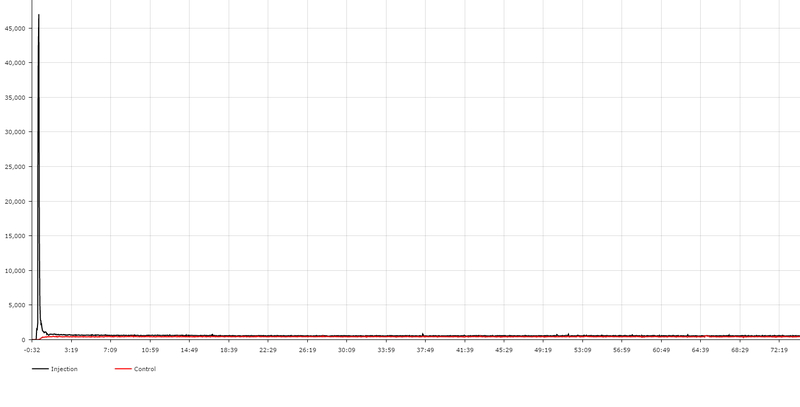 Sometimes a paravenous injection of the radiotracer occurs. When the radiotracer is injected or leaks into the tissue surrounding the injection site, it is known as an infiltration, sometimes referred as an extravasation. Infiltrations cause PET calculations to be made with erroneous data and therefore can affect PET interpretation and patient management. Infiltrations impact both the dose available to the patient during uptake and the effective length of the uptake period–both key quality indicators. Radiotracer remaining near the injection site means that some portion of the dose is not circulating as required for the full uptake period. By providing vital quality control information regarding the injection, the Lucerno system gives the clinicians what they need to determine if an infiltration has occurred and additional information to help characterize the severity. This knowledge helps determine the level of confidence the clinician can have when making patient management decisions based on a PET/CT image. Result: better quality care and lower cost. Infiltrations are only visible if the injection site is in the PET field of view. Most injections are administered in the arm, wrist, or hand. In many PET studies, the patient’s arms are raised above their head, resulting in the injection site being outside the field of view for the PET image. A recent study indicates that approximately one third of all visible infiltrations may not be picked up by clinicians reading the scans due to the limits of the field of view. Infiltrations are hard to quantify. A static PET image cannot provide true insight into the extent of the infiltration. In an investigational study, Lucerno technology captured infiltrations that were significantly different in scale throughout the uptake process, but resulted in PET images that appeared relatively similar. It is not surprising that infiltrations can resolve at different rates. The Lucerno system provides information that does not exist today–real visibility as to the extent of the infiltration during the uptake process. Before the Lucerno’s technology was available, there was no good way to tell if a bolus injection was successful. One limitation is that not all injection sites are imaged. Another limitation is that the PET image is a static snapshot, and cannot show the clinician what happened during the uptake period that could affect the quality of the image. As a result, clinicians may be making patient management decisions with a compromised diagnostic: they may be unaware that an infiltration has impacted the PET image, or if they see and infiltration, they may underestimate the degree of infiltration. This is not a trivial issue.  While there is not much public information available on infiltration rates, three large centers have published journal articles indicating their infiltration rate to be between 10% and 20%. Automated injectors may reduce the rate, but not to zero. At these rates, approximately 700,000 patients each year are affected worldwide. Lucerno studies confirm the published rates. Lucerno can address this quality gap with a simple tool used in conjunction with the PET injection process. By providing insight into the success of the injection before moving the patient to the PET/CT scanner, Lucerno can provide clinicians with important quality information to improve outcomes. By combining the Lucerno dynamic data with the static PET image, the clinician can better characterize the severity of the infiltration before patient management decisions are made. We conclude dose extravasations were commonly encountered (10.5%) in PET/CT. However, it is underreported by at least 31% due to omitting injection site from the FOV. When present, extravasations may lead to underestimation of SUVmax. The quantitative evaluation of patient studies revealed that paravenous injection is a relatively frequent effect (18%) with a small fraction of patients presenting considerable extravasations ranging from 1% to a maximum of 22% of the injected dose. 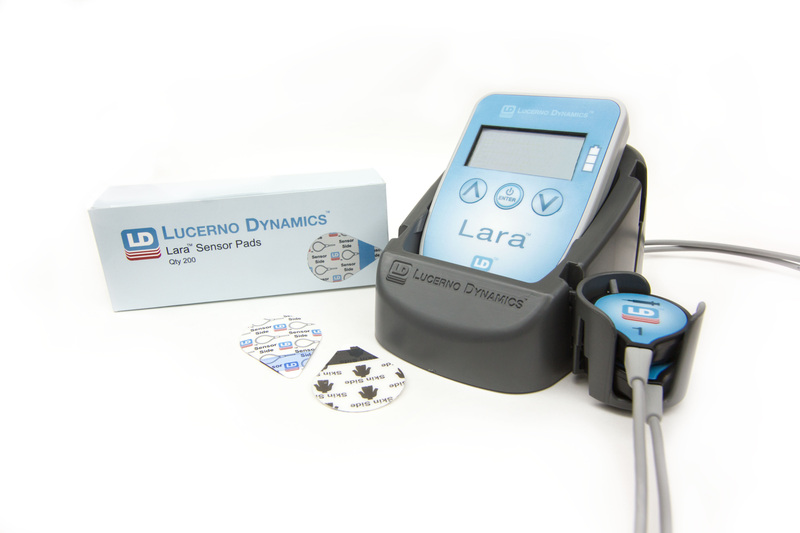 The Lucerno Lara® System is currently listed with the FDA and uses surface sensors to measure the radiation emitted from the areas of interest beneath the sensors. Prior to the injection, sensors are placed on each arm, so one captures the radioactivity from the radiotracer at the injection site and the other serves as a control. Forty-five minutes after the injection, the sensors can be removed and recorded data can be uploaded to Lucerno. Within seconds, Lucerno provides a report. Since our sensors record the level of radiotracer in the areas of interest during and after the injection, Lucerno provides clinicians with evidence of the level of radiotracer in the injection area during the uptake process. This information allows clinicians to evaluate the quality of the injection process to determine if an infiltration has occurred, and therefore the level of confidence that can be placed in the PET image used in the patient management decision making. The system is agnostic to the field of view in each clinic, the experience of the technologists, the quality of the patient’s injection vein, or if an auto-injector is used. The system is easy to use, requires no additional radiotracer, and just adds one to two minutes to the process, but provides the quality control needed to ensure a PET scan has not been compromised by an infiltration. Quality control of injections is important for everyday use of PET scans and vital for clinical studies that rely on PET scans as part of the protocol. It is extremely important to control the quality of the PET/CT scan, particularly when it has implications for monitoring response to therapy and the management of the patient. The Lucerno sensor can assess the quality of the injection process, removing at least one potential source of variability from the scan protocol. This Lucerno graph shows the results of four scans taken over six months for the same patient. The green lines are from the bicep sensor on the left arm, the injection arm. 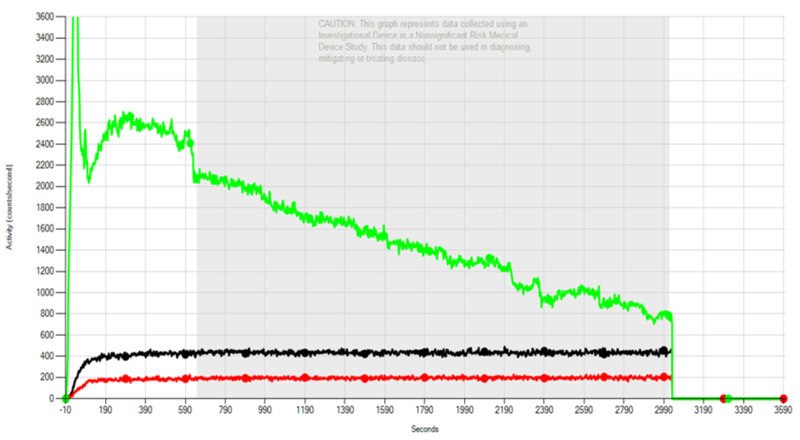 The spike and immediate drop in the green lines during the first 20 seconds reflects the radiotracer bolus passing underneath the sensor during the actual injection. 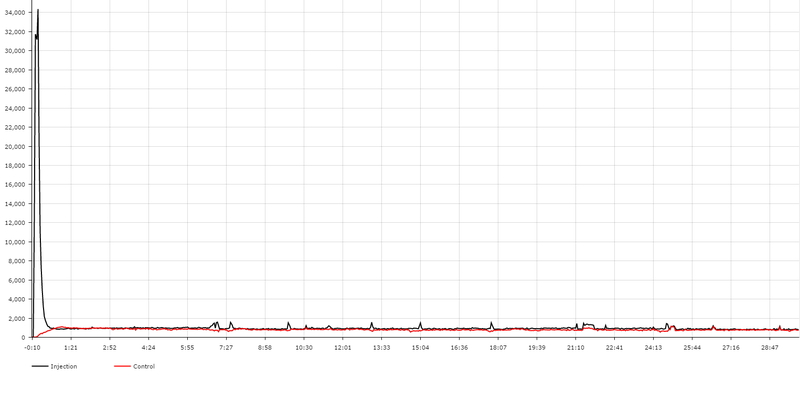 This initial spike, combined with the following stabilization at a low level of radioactivity–indicative of the expected low metabolic activity in this area of interest–suggests an ideal injection of the radiotracer. 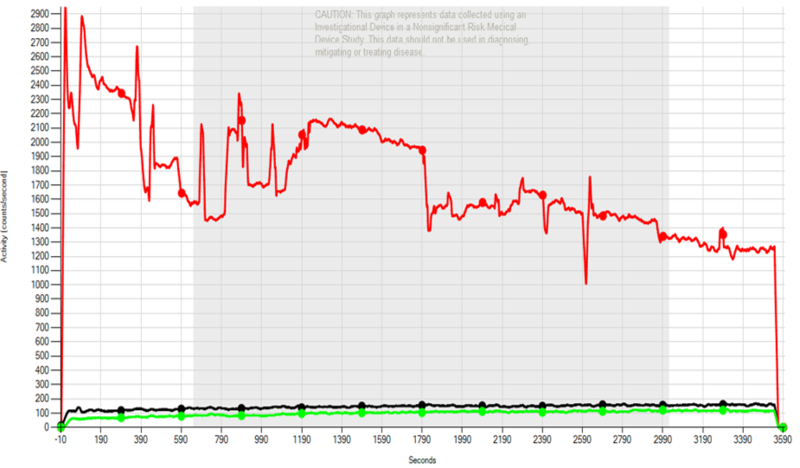 The red line in the Lucerno graph (below left) shows a dramatically high level of radioactivity detected by the right arm sensor on the injection arm during the entire pre-PET uptake period. 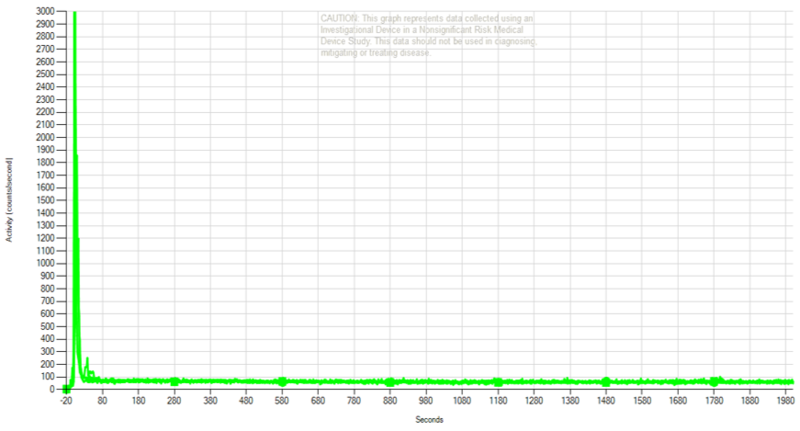 This high level of radioactivity resolves very minimally over the pre-PET uptake period. Tumor area of interest uptake (black line) was impacted by the fact that much of the radiotracer dose remains in the injection arm during the uptake period. 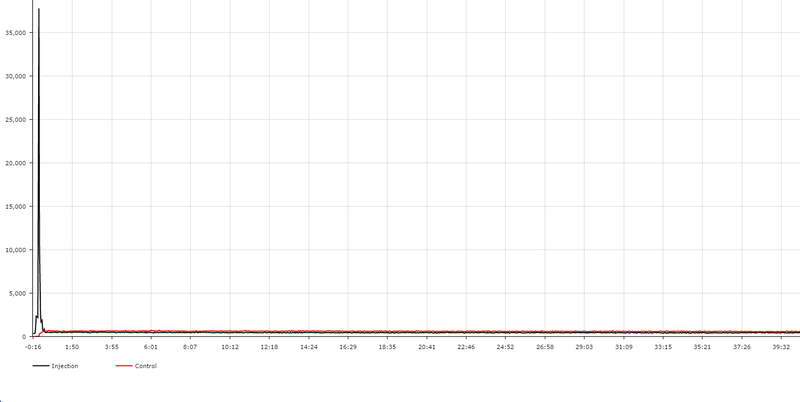 The green line shows the readings from the left arm sensor, in this case, the control. 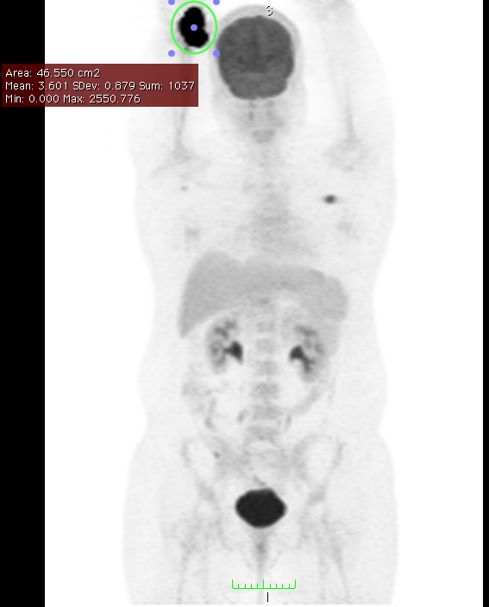 When the Director of Nuclear Medicine and Positron Emission Tomography reviewed the resulting PET scan image (below right), she noted that there was “a lot of infiltration” and concurred with the Lucerno graph. An infiltration, but how extensive? 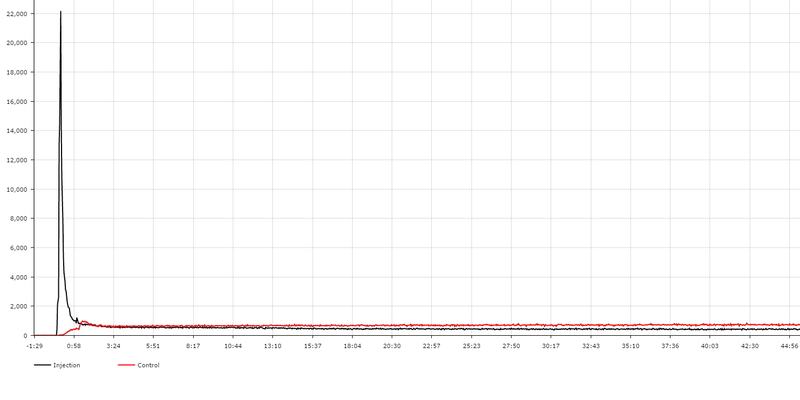 The graph (below left) shows a patient scan with a small amount of radiation in the area of interest over the injection site. The red line drops sharply and nearly returns to a low, stable level of radioactivity, but still remains noticeably higher than the control. The Director of Nuclear Medicine and Positron Emission Tomography reviewed the PET image (below right) and classified this patient as having a “slight infiltration”. 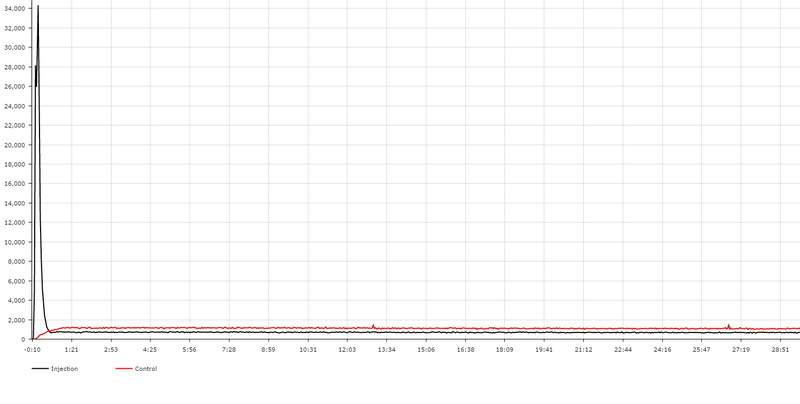 While the static PET image only captures a moment in time, we can confirm with the Lucerno graph that this patient had a slight infiltration during the uptake period. 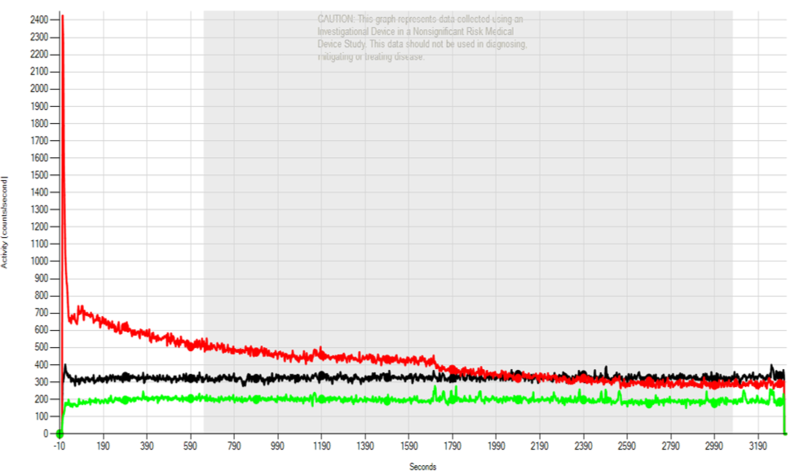 The third example graph (below left) shows a patient scan with a significant level of radiation in their left arm (green line) that resolved very differently from the previous patient, yet resulted in a similar, static PET image (below right). The PET images for both these patients indicate only a slight infiltration. Because the infiltrations resolved at different rates, there was no way to tell from the static PET image that the infiltration was dramatically more extensive for the third patient (below) compared to the second patient (above), and therefore would have a far greater affect on the quantification of the PET scan, potentially impacting a clinician’s patient management decision. Ideal injections are easy to spot. Lucerno can provide QA/QC for all PET radiotracer injections. The Lara System is intended for use in nuclear medicine to provide quality control for radiotracer injections. With the Lara System, clinicians can know, before the uptake period is over, whether the injection was ideal or not. While it is important to provide quality control for each individual radiotracer injection, the Lara System can provide quality assurance for a nuclear medicine center’s injection process. By using the Lara System with Lucerno’s proprietary software, centers can identify contributing factors, make appropriate adjustments, and improve quality. Through periodic reviews of contributing factors and process improvements, centers can drive their overall infiltration rate down, and drive their quality indices up. What is an 18F-FDG (FDG) infiltration? An FDG infiltration is the inadvertent administration of FDG anywhere outside the vascular compartment, such as into the subcutaneous tissue surrounding a vein. How does an infiltration happen? Some of the injected dose can escape outside the venous compartment as a result of multiple causes. • A puncture through the posterior wall of the vein can occur. • Arm movement, after catheter placement and prior to injection, can cause the catheter tip to damage the vein wall. • Injecting the FDG dose too rapidly can increase intraluminal pressure enough to rupture the vein wall, sometimes referred to as “blowing a vein”. • Thrombosis or restriction of the normal venous blood flow, proximal to the injection site, can adversely impede the flow of the radiotracer to the systemic circulation. All of these problems are more common in patients with chronic illnesses that have required repeated venous access. Patients with cancer who have been treated with sclerosing chemotherapy regimens are particularly prone to issues with venous access and infiltrations. 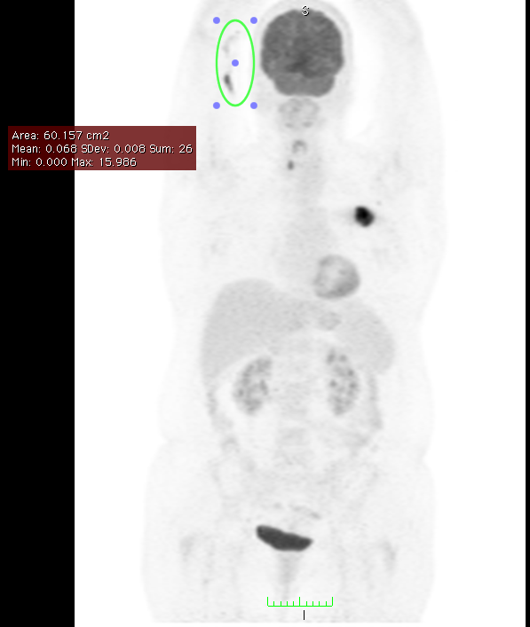 Do infiltrations really matter to the results of a PET/CT scan? Absolutely. An infiltration can have a major impact on both quantitative and qualitative PET/CT results. 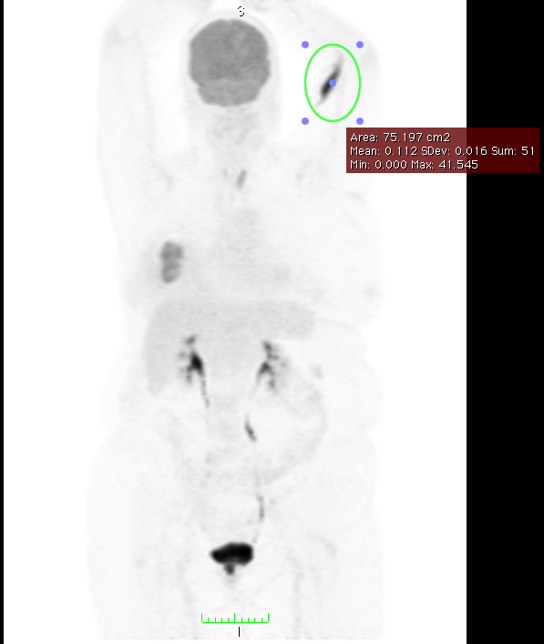 How does an infiltration impact quantitative PET/CT results? Patients receive a prescribed dose of FDG, which is critical in calculating standardized uptake values (SUVs). When the dose is not completely delivered to the circulation, the SUV calculation and tumor uptake are impacted, leading to incorrect values. Clinicians use SUVs taken before and after treatment in order to assess patient response to therapy. SUVs are also sometimes used to help determine tumor malignancy. Infiltrations invalidate quantitative PET/CT results. How does an infiltration impact qualitative PET/CT results? The prescribed dose and the length of FDG uptake time are necessary to provide optimal image quality for that patient. When the dose is not completely delivered, tumor uptake is lowered. Additionally, each nuclear medicine center prescribes the amount of time that the FDG should be circulating in the patient’s vascular system to provide them with the optimal results. During ideal injections, FDG enters the venous system as a bolus and is almost immediately available to the tumor for uptake, leaving small amounts of FDG circulating in the venous system later in the uptake period. An infiltrated dose may leak back into the venous system during the uptake period and during image acquisition. Since infiltrations cause lower tumor uptake and higher FDG levels in circulation during imaging, the tumor-to-background contrast can be reduced, making it more difficult to detect tumors with relatively low metabolic rates. Thus, an infiltration results in degraded PET/CT images used by clinicians to stage and assess therapy. Is it possible to assess infiltrations in PET/CT images and then correct the results? In current practice the injection site is often not in the image field of view, so not all infiltrations are seen. When an infiltration is in the field of view, it is difficult to accurately quantify using the image. Most importantly, even if one is able to see and quantify the infiltration in a static image, Lucerno has found that this may not reflect the true extent of the infiltration at the time of the injection and during the entire uptake period. Why aren’t injection sites in the field of view all the time? Is this a problem? The most common practice is to have patients place their arms over their heads during a PET/CT scan. Since this field of view is from skull base to mid thighs, the injection site is often not visible to clinicians. If an injection site is not in the field of view and there is an infiltration, clinicians using the PET/CT results will be unaware that the image and SUVs are compromised. If a clinician can see the injection site, why is it difficult to quantify the infiltration? It is theoretically possible to quantify how much radiotracer is near the injection site if a trained professional is willing to trace its entire area on every axial slice of the image where an infiltration is visible. But adjustments to the net injected dose that are made by creating a volume of interest that is properly corrected for attenuation, scatter, and partial volume effects is not only labor intensive, it also requires special skills and tools that are not ordinarily deployed in clinical practice. In the end, all of the effort may be of limited value anyway. Why would quantifying a visible infiltration be of limited value? Lucerno has found that the amount of radiotracer present at the time of image capture (usually 60-90 minutes after the injection) may not be representative of the amount of FDG that was at the infiltrated injection site during the uptake period. In nearly every infiltration case that Lucerno has observed, the FDG at the injection site resolves, either through the body’s lymphatic system or by leaking back into the venous system. As a result, measuring a static image of an infiltration an hour or more after it occurs cannot adequately characterize the true nature and extent of the infiltration. What if the infiltration is truly minor, does that matter to the dose and to the PET/CT results? It is true that a minor infiltration causes only minor problems with sensitivity and comparisons to other scans, but it is difficult to determine the point at which an infiltration causes meaningful problems. Current practice strives to deliver a precisely known dose. After injecting FDG, technologists flush the injection catheter with saline to wash the FDG into the vascular system, then measure the residual FDG in the injection syringe. While this residual amount is usually small (0.5% to 1.5% of the original dose), technologists subtract the residual radioactivity from the injected dose to ensure the scanner has an accurate “net dose”. The effect of an infiltration on the net dose will likely be higher than the residual dose in the injection syringe, but no steps are being taken today to address infiltrations. • The only way to track infiltrations today is to review PET/CT images for infiltrations. Nuclear medicine centers using a field of view from skull base to mid thighs will miss many infiltrations. Only centers that always image the injection site can realize that infiltrations have occurred. • Reviewing past radiology reports is not an effective way to track infiltrations, since visible infiltrations (especially those considered to be minor infiltrations) are not always reported by clinicians. • When injecting FDG, technologists are often unaware that an infiltration has occurred and therefore do not follow the self-reporting guidelines, which advise imaging the injection site. The physical volume of FDG that a technologist injects into a patient is usually small; therefore, a visible manifestation of an infiltration is often not evident to the patient or the technologist. Finally, FDG does not usually cause the patient much, if any, discomfort so technologists are not alerted to a possible concern. In the hospitals that have looked into this issue by reviewing every image, what is the rate of infiltrations? There are a limited number of publications on this topic, but a few hospitals have presented abstracts or articles on the rate of infiltrations. Ohio State University, St. Louis University, and the University of Santiago in Spain appear to be the leaders in this subject. These sites have presented results on over 2,000 patients, and the infiltration rates have averaged between 9% and 21%. Aren’t most of the reported infiltrations minor? Many centers note that the majority of the infiltrations found on static images appear small. However, Lucerno’s experience involving dozens of infiltrations is that nearly every infiltration resolves (often dramatically) during the uptake period, but small at the end of uptake does not necessarily mean the infiltration was small the whole time. This finding leads us to believe that the degree of infiltrations is being understated in the current clinical setting. What is the bottom line about the impact of FDG infiltrations? Since visible infiltrations can be mischaracterized as minor and many infiltrations are undiagnosed due to field of view limitations, clinicians are unaware their PET/CT results have been compromised. Lucerno believes that infiltrations represent an insidious source of variance in PET/CT images that should be minimized, since these images are critical for proper staging at the time of presentation and assessing therapy response during follow-up. Will infiltrations continue to be an important issue in the future? An infiltration will have an even larger impact with the coming changes in medical practice. As we move towards more personalized, precision medicine, PET/CT is becoming progressively more quantitative. An infiltration invalidates a PET/CT scan used for quantification. Additionally, there is a movement towards exposing patients to radiation levels as low as reasonably achievable (ALARA), driving improved PET/CT scanners and lower FDG doses. Infiltrations leak a certain volume of the FDG into the subcutaneous tissue. With lower FDG doses, this infiltrated volume represents a larger percentage of the delivered dose than in the past, making infiltrations even more concerning in the future. How can we fix this FDG infiltration problem? Lucerno offers support for a comprehensive program for continuous quality improvement. The program starts with accurate measurement. Assessing how often FDG infiltrations really occur at a center is the first step to improving the problem. Only then can a center examine the circumstances that lead to infiltrations and develop a plan to implement corrective actions to minimize infiltrations in the future. After remediation plans have been instituted, new measurements should document improvement. These new “best practices” should become standardized across centers to ensure that all benefit from this knowledge. This should cause a continuous and meaningful drop in FDG infiltration rates. Will identifying FDG infiltrations lead to the complete elimination of infiltrations? It is unlikely that a process involving 2 humans performed 4.5 million times each year can ever be perfect, but an infiltration rate approaching 1% should be possible. Trained infusion nurses injecting chemotherapy agents have lowered their infiltration rates to ~1%. While certified nuclear medical technologists are committed to providing optimal imaging to their patients, they are not always trained to the same standards as infusion nurses. By using the Lara System to help identify each infiltration case, focusing on sharing best practices, and establishing new standard techniques, nuclear medicine labs should be able to reduce the infiltration rate towards 1%. Even with such a low infiltration rate, clinicians will still want to know which 1% of patients are affected by infiltration. Would you like to use the Lara System in your center? The Lara® system is FDA listed for the QA/QC application described on this page.